Have you seen a purple vegetable in the produce section, and mistaken it for a purple cabbage? It is likely radicchio, which is a form of leaf chicory. Radicchio is sometimes used to give a dish a certain “pop” with its purple color. Not only that, but it adds a ton of nutrition to your meal, and specifically contains a high level of vitamin K and antioxidants that may prevent certain cancers. Read on to find out why you should add this vegetable to your next salad. Radicchio deceptively looks like a red or purple cabbage or lettuce from the Brassica group of vegetables, but it is actually a quick growing, Mediterranean, red-colored leafy chicory vegetable. It belongs to the Asteraceae or daisy family, and the genus Cichorium. The perennial vegetable is often used for salads in the Veneto region of Italy. It is also sometimes called Italian chicory. It has bitter-tasting, wine-red leaves that set it apart from other leafy vegetables. There are many varieties named after Italian regions where they originated, with the most common being Chioggia. Another type is an elongated crop called Treviso, which resembles a romaine lettuce heart or Belgian endive. Tardivo and Castelfranco are types that look like flowers and are only available in the winter. Radicchio has had a history of being a healthy food for some time now. A Roman author and natural philosopher named Pliny the Elder claimed in his encyclopedia, Natural History, that it was used to treat insomnia and purify the blood. Later, it was discovered that a nutrient found in the vegetable called intybus is a sedative and mild pain reliever. Cultivation of radicchio began in the 15th century, and it continues to this day. How did it make its way into many Western kitchens and restaurants? In 1977, The New York Times food editor, Craig Claiborne, discovered it while on an Italian trip. What are the radicchio nutrition facts? It is loaded with vitamin K with 128% of the recommended daily value. Aside from that, it contains small amounts of carbohydrates, fiber, fat, protein, vitamins A, C, E, B2, B3, B5, and B6. It also contains folate, choline, calcium, iron, magnesium, phosphorus, potassium, zinc, copper, manganese, and selenium. The following is a comprehensive nutrition chart with information for a cup of shredded radicchio, or 40 grams of the vegetable. What are the health benefits of radicchio? The antioxidants found in it help fight cancer, and also repair specific types of liver injury caused by oxidative stress. It also contains a large amount of zeaxanthin and lutein, which are key antioxidants for eye health. The inulin in it also helps balance the body’s blood sugar levels. Radicchio also benefits heart health, fights the growth of cancer cells, contributes to healthy bones, and treats certain parasites. It also encourages weight loss, digestion, and maintaining the body’s metabolism. Here are four detailed health benefits to help understand more about this delicious vegetable. Studies have found that the antioxidants in radicchio have been shown to fight a particular liver cancer cell called Hep-G2. When the plant is fertilized without being exposed to pesticides, the antioxidants that fight this cancer cell are found in higher amounts. A study published in the journal Carcinogenesis in 2001 discovered that radicchio extract has a significant effect on the early stages of colon cancer. It was also found that the plant-based sugars found in radicchio called fructans may reduce the risk or impact of colon cancer. The vitamin K in it can also decrease the risk of colon, stomach, prostate, oral, and nasal cancers. Radicchio is a key food in the Mediterranean diet that is known to support heart health. The vitamin K content also helps decrease inflammation of cells lining blood vessels, prevents calcification of arteries, decreases heart attack risk, and contributes to healthy blood pressure. A rat study published in the journal Molecular Nutrition & Food Research in 2015 found that it exhibits heart-protective effects, including reducing inflammation, decreasing cholesterol levels in the heart, and lowering lesion size on damaged hearts. 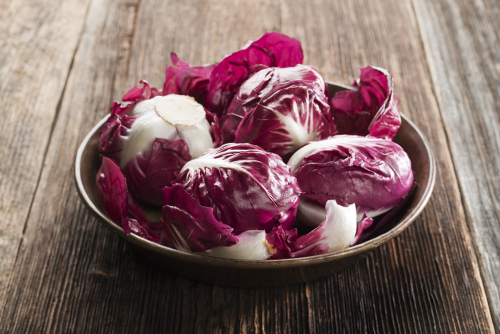 Radicchio also helps the body build and maintain strong bones due to the high amount of vitamin K. As a result, the vegetable is useful in the prevention and treatment of osteoporosis since it also increases bone mineral density. Vitamin K also helps the body better absorb calcium, and this also helps build bone density. A pilot study published in Parasitology in 2016 examined radicchio for its impact on parasites. The researchers found a significant antiparasitic effect on a certain type of roundworm common in swine. This discovery indicates a potential benefit of possibly fighting other parasites. Radicchio has a characteristically bitter taste that makes it a welcomed ingredient in fresh salads, or you can sautée it with other tasty ingredients. While it can be quite expensive, you don’t need to get a lot of it to create a delicious punch in your meals. When selecting radicchio at the store, look for bright, wine-colored heads with midribs, and avoid the ones with bruised or cracked leaves. It stores in the refrigerator in a temperature below 46°F for up to three weeks before you plan to cook and eat it. When preparing radicchio, cut off the outer leaves in a similar way you would with cabbage, then rinse the head and cut into halves and quarters. You can eat it raw in a salad or other cold dishes, or cook it in various recipes. Cooking will reduce the sharp and bitter flavor of the cold leaves. The following are a couple of radicchio recipes to help you get started with this vegetable. Cut each head of the radicchio in half lengthwise. Then cut each of them into four wedges and set aside. In a small bowl, whisk together the vinegar, salt, pepper, garlic, thyme, oregano, and three tablespoons of the olive oil. Heat the remaining oil in a large skillet over medium heat, and add the radicchio in a single layer and cook for three minutes. Turn the radicchio, add the vinaigrette, and cook for about three more minutes, until it is tender and slightly browned. Serve at room temperature or warm. In a large bowl, whisk together olive oil, vinegar, and honey. Add the tomatoes, cucumber, and radicchio, and toss to combine. Season with oregano, salt, and pepper, and serve. It is no secret that radicchio is a good source of vitamin K, and can help treat cancer and parasites while contributing to a healthy heart and strong bones. However, like other foods, it is possible to be allergic to it. Stop eating it immediately if you experience itching of the lips, swelling of the throat or mouth, or any other allergic reaction. Some online warnings claim that you should not consume it during pregnancy; however, no scientific research confirms this concern. Consult your doctor if you do have concerns with radicchio while breastfeeding or pregnant. “Radicchio, raw Nutrition Facts & Calories,” SELF NutritionData; http://nutritiondata.self.com/facts/vegetables-and-vegetable-products/3018/2, last accessed June 28, 2017. Claiborne, C., “The Cuisine Of Northern Italy A Cook’s Tour,” The New York Times, July 27, 1977; http://www.nytimes.com/1977/07/27/archives/the-cuisine-of-northern-italy-a-cooks-tour-the-cuisine-of-northern.html?_r=0. Hughes, R., et al., “Stimulation of apoptosis by two prebiotic chicory fructans in the rat colon,” Carcinogenesis, January 2001; 22(1): 43-47. https://www.ncbi.nlm.nih.gov/pubmed/11159739.